Now that the compatibility issues have been solved, the next step is to dismantle all the components from the Dahon Boardwalk and transfer them to the new Wheelsport Fantasy mini velo. Along the way, I also decided to change some of the components to more suitable ones. For example, I was previously using a compact 50/34T Ultegra 6800 crankset on the Dahon Boardwalk, when I upgraded to 11 speed. Even though it was a compact crankset on a small wheeled bike, the small 11-25T cassette enabled a sufficiently high gearing to be achieved for my needs. 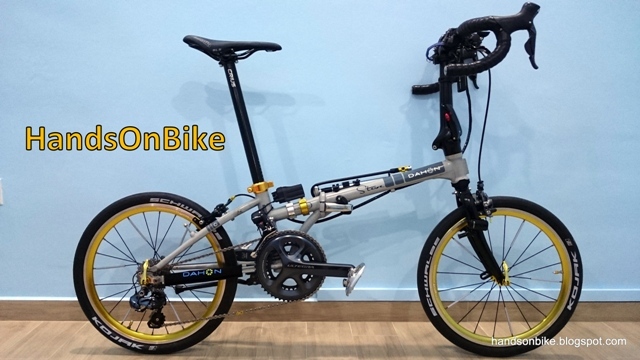 However, I believe that once I change from the Dahon Boardwalk folding bike to the Wheelsport Fantasy mini velo, the top gear with the same components (50T front and 11T rear) will not be high enough. 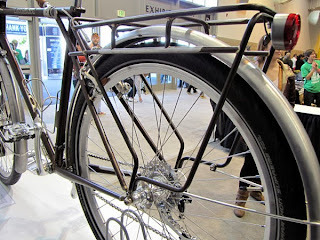 This is because the mini velo has a stiffer frame, as it does not have any folding joints. As a result, I will be able to push harder and go faster without experiencing as much frame flex. A higher top gear is thus warranted based on my experience and expectations. Therefore, I decided to increase the top gear by changing from a compact 50/34T crankset to a mid-compact 52/36T crankset. It is called a mid-compact as it has a gearing setup that is somewhere between a compact 50/34T and a standard 53/39T crankset. The 52T large chainring will enable a high gearing, almost similar to that of a standard 53T chainring. On the other hand, the 36T small chainring will maintain a sufficiently low gear for hill climbing, much better than the 39T of a standard crankset. This 52/36T mid-compact is thus very versatile as it gives a nice wide range of gears that is suitable for going fast or climbing hills. I found that the difference between this 52T chainring and the 50T chainring is only the size of the outer aluminium teeth. The bonded composite material at the back of the chainring is the same size. Comparing the 50T chainring with the 52T chainring shows that the only difference is the amount of chainring that sticks out from the hollow outer shell. The 52T chainring has teeth that sticks out further due to the two extra teeth. With this new 52/36T crankset, the overall gearing table is as shown, for 20" (406) wheels. 15 unique gears are available for this 2x11 speed drivetrain. A graphical illustration comparing the gear range of my older setup (53/39T crankset with 12-27T cassette) and this new setup (52/36T crankset with 11-25T cassette). Click for a larger picture. With this change, I can get a wider total gear range (higher top gear), while maintaining the same low gears. This can be seen from the bar chart above. Also, with the switch to this drivetrain setup (2x11 speed, 52/36T crankset, 11-25T cassette), I get 15 unique gears to use, instead of the previous 13 gears. In conclusion, this new setup gives a wider gear range with more unique gears in between, which is a really good result! Along the way, there are also some components that cannot be transferred from the Dahon Boardwalk to the Wheelsport Fantasy mini velo. This is mainly due to compatibility and sizing issues. A long Di2 battery mount is required, as I plan to mount the battery using the bottle cage screw holes. This means that the previous short Di2 battery mount cannot be used. I also got a new saddle, seatpost, stem and handlebar for this new mini velo. These are mostly high end components for lighter weight and better function. The lightweight and yet comfortable Selle Italia SLR Kit Carbonio Flow saddle. The same as the one found on the Merida Scultura 5000. A new seatpost was also required as the seatpost diameter required for the Wheelsport Fantasy mini velo is much smaller (27.2mm) than the large Dahon seatpost diameter (33.9mm). Weighs 239 grams, which is a low weight, but definitely not the lightest available. I chose this seatpost partly because the subtle graphics would match the frame. ITC stands for Independent Top Clamp, which allows the saddle fore-aft setting to be adjusted independent of the tilt angle. As shown here, there are separate bolts which adjust the fore-aft setting and tilt angle independently. As the Selle Italia SLR Kit Carbonio Flow Saddle requires a top down clamp for the carbon rails, I had to choose the clamp type carefully. Although this clamp is tilted at a slight angle, it is still able to clamp the carbon rails properly without any unusual gaps. These carbon rails are also oval shaped, being 9mm tall and 7mm wide. Lastly, this is the new carbon handlebar that will be used on this mini velo. This FSA carbon handlebar is the same as the one found on the Merida Scultura 5000. I had actually bought two of these handlebars during a sale, and now is a good chance to make use of the second one. FSA K-Force Compact Road Carbon Handlebar. Lightweight at only 204 grams. With the same Ultegra ST-6770 Di2 shifters installed on the FSA handlebar. All ready to be mounted on the bike! All other components, such as the drivetrain components will be taken from the Dahon Boardwalk. In the next part of this upgrade series, the assembly of the Wheelsport Fantasy mini velo will begin! Hi, can I use the regular stock seatpost clamp for oval shaped carbon rail seat? tks. I'm not sure what he stock seatpost clamp looks like, do you have a link to a picture?